Hi. I'm a new owner of a Pioneer Mitchell and thought I'd post up some feedback based off our experiences so far. 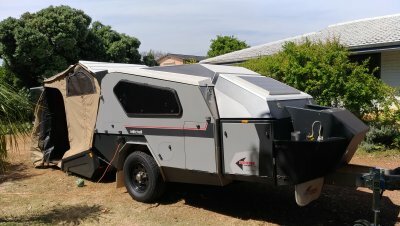 Currently we have only done a 1 week camping trip but will have 28 days in it for our July Kimberley trip. 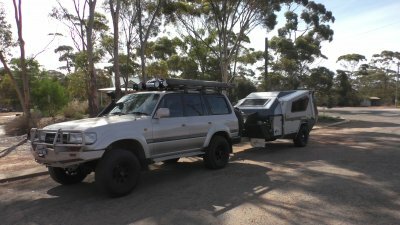 very easy setup and pack up - setup to sleep 4 in about 2 minutes without an awning. We keep the kids mattresses on the bed and just slide them onto the floor of the camper at night. dust getting in through the tailgate. I found the tailgate has 2 holes open to atmosphere, I guess for releasing air pressure when closing/opening. I'm going to screw in some brass air breathers that filter the dust. kitchen sink is awkward to get to due to the stove being partly in the way. Not bad enough to be a problem but could've been better. The new design kitchen rectifies this. standard water tank is only 120 litres. The option for the 2nd tank adds 60 litres but its connected to the standard tank so we would have the risk of using all the water showering. I ordered a custom made water tank that gives me an extra 120 litres and have plumbed it up separately so its used for drinking water. fridge and lights are connected with ciggy plugs. As usual these come loose on corrugated roads. I've ordered merit plugs to replace these. That's about it so far. If anyone is interested I can update this after the Kimberley trip where it will get a real good run. Looks good mate , My brother has bought a similar setup in a different brand , nice and compact , looks great . well now I'm pissed off Spooner. Mine doesn't have a fire place! Mate, go with Andersen plugs. Merit plugs come loose too.